Dr. Smela's research is primarily in the field of microelectromechanical systems (MEMS), particularly polymer MEMS and bioMEMS. She focuses on the use of organic materials (from polymers to cells) in microsystems to realize microactuators, cell-based sensors, and CMOS/MEMS integrated systems. Dr. Salamanca-Riba will help facilitate opportunities for advancement among University faculty members, especially under-represented groups. Ghodssi, Clark School researchers in NSF workshop on micro, nano, bio systems. Joint efforts to target bioengineering, renewable energy, nanomaterials, microsystems, education. Clark School faculty promotions, moves announced. An interdisciplinary team of Clark School faculty wins multi-year grant. New bio-sensors could speed up and improve the detection of pathogens, explosives. BioE grad student to develop fast, portable biosensor. $10M effort to develop networked micro-vehicles for assisting soldiers. Engineers Without Borders team improves quality of life for African village. 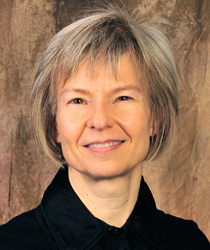 Assistant Professor Elisabeth Smela is the recipient of the Presidential Early Career (PECASE) Award for 2003, presented in 2004. Clark School faculty succeeded in obtaining Multidisciplinary University Research Initiative (MURI) award of $5.25M.